To view the full Product Guide please click on the "More Info" button below. 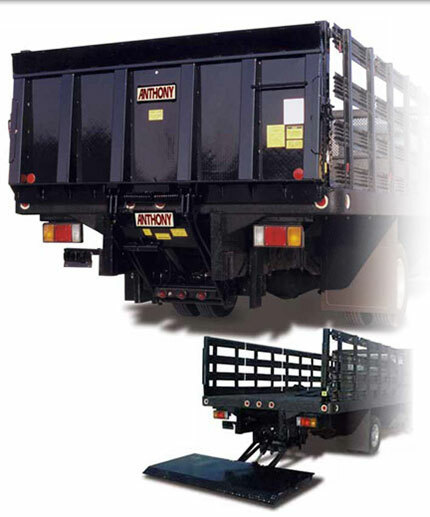 Anthony’s LoadBlazer delivers performance and value. LoadBlazer has a unique Stabilizer beam, a beefy 3”, 11 ga. Tubular steel beam connects two lift arms balancing heavy loads and virtually eliminating side shifting. Twin hydraulic cylinders provide Direct drive lifting power, evenly at each side. No lifting cables or chains to maintain and wear out. Anthony’s RailTrac series offers unparalleled design features including *LIFETIME Warranted slide runners, lockable steel power unit enclosure, pressure compensated flow valve for constant lowering speed. 2+2 Warranty 2 years on mechanicals and 2 years on hydraulic system, parts and labor. Closed hydraulic system to keep dirt and moister out, Large bore double weight hydraulic cylinder, chrome plated cylinder rod, low operating pressure increases component life. Relief valve prevents overloading, Spring assist platform for ease of operation, superior corrosion protection with shot blast and double top coated. Pressure Compensated Flow Valve Provides constant and controlled lowering speed of the platform, loaded or unloaded, and prevents platform from "free fall" under certain hydraulic failures. Chrome Plated Piston Rod Double the thickness of regular chroming to better keep surface free from rust and contamination to protect seals and extend cylinder life. Low Operating Pressure Extends service life of power unit, cylinder seals, and battery. Circuit Protection 200 Amp In-Line Fuse protects the truck wiring and power system in the event of a "dead short. 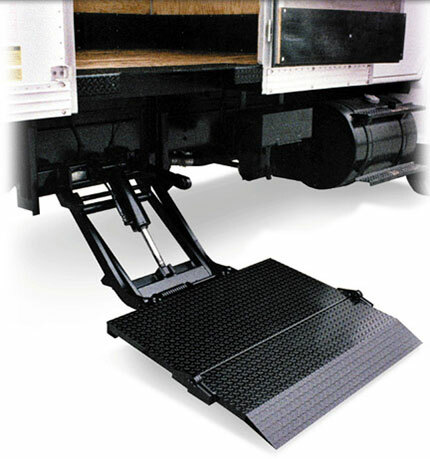 "Heavy-Duty 3/16" Diamond Tread Floor Extension Provides rugged and attractive surface. Platform Roller Wheel Opener Prevents metal-on-metal damage and provides smooth folding and unfolding. 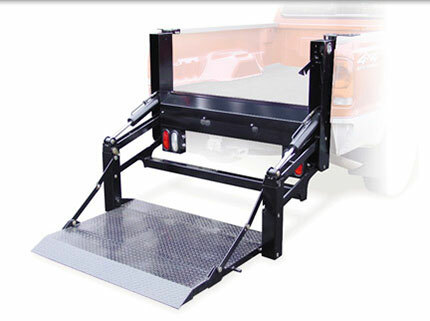 Dual Spring Assist Platform dual torsion springs provide easy opening and closing. (Single spring on lowboy models.) 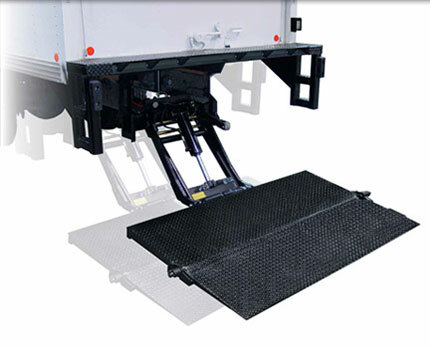 Heavy-Duty Sandwiched Hinge Plate Maintains platform stability under heavy load conditions. Heat Shrink Electrical Connections 2 + 2 Year Warranty Two years on mechanical components, two years the hydraulic system, parts and labor. Factory Filled Hydraulic Power Pack. Spring Counterbalanced Platform Design For easy and reliable opening and closing of platform - manual. Special “Service-Free” Bushings At Major Wear Points No grease zerks to service. Low Pour Hydraulic Fluid For better cold weather performance. Toggle Switch Control, Stationary Mount Lockable Steel Power Pack Enclosure Diamond Tread Platform Surface Circuit Breaker - 200 Amp. Protects against a “dead short” in the power cable Silicone Sealed Heat Shrink Electrical Connections Pressure Compensated Flow Control Valve Chrome Plated Piston Rod 12 Volt DC/Hydraulic Drive Meets TMC Recommended Practices Yellow Di-Chromate Plated Pins Used at all pivot points. Pressure Compensated Flow Valve To provide constant and controlled lowering speed. Relief Valve prevents overloading during lifting cycle. Piston Cylinder Wear Rings to prevent scoring. EZ Mount Installation Hydraulics are factory assembled, just attach platform. Latch Pin Assembly to hold gate securely in closed position. 2 + 2 Warranty 2 years on mechanical components; 2 years on hydraulic system, parts, and labor. Low Operating Pressure Extends service life of power unit, hoses, cylinder seals, and battery. ZLC Zero Leak Concept Uses machined fittings, SAE “O” rings, and JIC hydraulic connections. 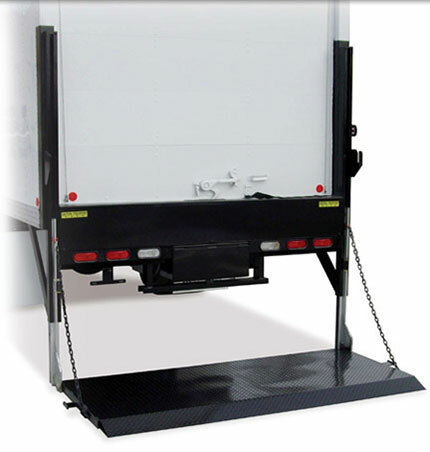 Platform Latch Assembly Platform is secured in the closed position by two “Chain & Staple Assemblies”, one attached to each side of the truck body, or upright supports. LIFETIME Warranted Slide Runners Guarantees consistent, trouble-free service. Lifting Platform Pivots to allow dumping of materials. Lockable Steel Power Unit Enclosure Protects power pack from weather, theft, and vandalism. Pressure Compensated Flow Valve Provides constant and controlled lowering speed, loaded or unloaded. 2 + 2 Warranty 2 years on mechanical components; 2 years on hydraulic system, parts, and labor. Marine Duty Sealed Toggle Switch operates reliably under all types of weather conditions. Closed Hydraulic System Protects against outside dirt, moisture, and other contaminants. Circuit Breaker - 200 Amp. Protects against dead short in power cable. Chrome Plated Piston Rod Keeps exposed surface free of rust and contamination to protect seals and extend life. Low Operating Pressure Approx. 2300 psi. Increases life of components. EZ Mount Installation Shipped Completely pre-assembled for fast, clean, easy installation. 12 Volt DC Drive Relief Valve Prevents overloading during lifting cycle. Factory Installed Hydraulic Fluid Prevents contamination during installation and insures proper fluid. 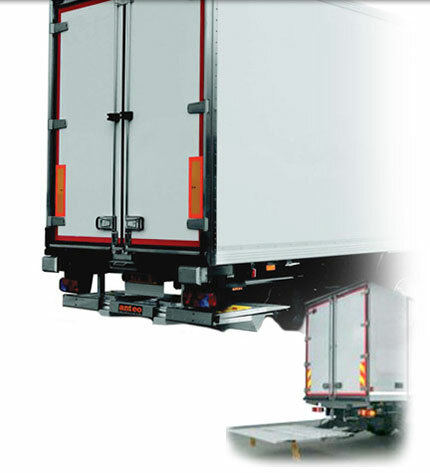 Spring-Assist Platform Provide easy opening and closing. Low Profile Platform - 2.5 Heavy-Duty Roller Chain Drive Provides long operating life and greater reliability than cable drive. POWER Up, GRAVITY Down And Spring Assisted Manual Fold/Unfold Level Ride Platform Maintains ride that is level with rear of truck. Heat-Shrink Siliconed Wire Terminals and Anit-Rotation Terminals Ensure positive electrical connections. Low Pour Hydraulic Fluid Excellent cold weather performance and long, trouble-free service. ZLC Zero Leak Concept Uses machined fittings, SAE "O" rings and JIC hydraulic connections. Meets TMC Electrical Recommended Practices. 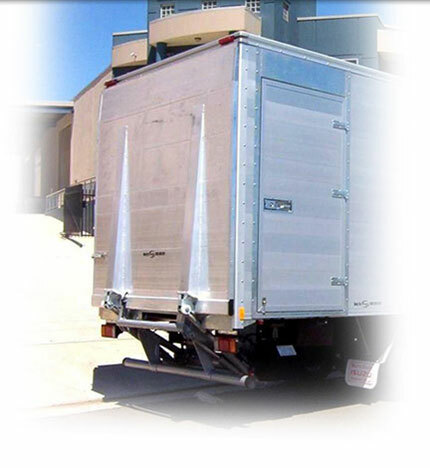 Platform in aluminum alloy Teflon wheels to prevent platform wear Steel guides with high yield limit, treated and chrome-plated with possible adjustment Tail-lift deployment and stowage under chassis by means of double extension cylinder Tail-lift deployment by means of high precision chrome-plated guides Automatic hydraulic tilting of platform to ground Mechanical stop of tail-lift arms against equipment (adjustable in 3 positions) – full version only Pre-assembled control box support for quick installation Type-approved tail-lift as rear bumper Power pack equipped with: Closing seal, compact and soundproof Electrical connections with modular extractable board Electrical board for any type of connection through keyed connectors 2 single-acting lifting cylinders with lubrication 2 single-acting tilt cylinders with lubrication 1 cylinder for automatic at ground level 1 double ram for tail-lift deployment, stows under chassis Cylinders protected by rubber gaiters – full version only Built-in safety solenoid valves on every cylinder Tank with air filter Chrome-plated steel cylinder rods with high yield Flow adjusters compensated on downward movements External control box with illuminated control panel Control with no electronic components Cut off switch with key Two-hand use for operator’s safety Motor with thermal safety device Motor relay with 350 A silver pin (peak current) Proximity switches for automatic positioning of tail-lift Battery cable with inline circuit protection Bolted assembly brackets – full version only Brackets welded by the assembler – basic version only material conform to EC standards Steel cataphoresis-treated pins Anti-friction self-lubricating bushings with lubricator Delivered in assembled kit and tested, mounted to the chassis by bolting, eliminating the need to re-paint. Platform in aluminium alloy or in sandblasted steel with hexacrylic electrocataphoresis treatment. Teflon wheels to prevent platform wear. Powered opening of the platform. Automatic hydraulic tilting of platform to ground. Tilt of platform in all positions. 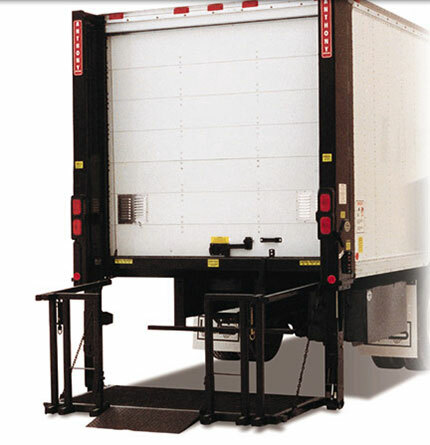 Mechanical stop of tail-lift arms against equipment (adjustable in 3 positions). Closing seal, compact and soundproof. Electrical connections by means of modular extractable board. Electrical board for any type of connection. 2 single-acting lifting cylinders with lubrication. 2 double-acting tilting cylinders. Cylinders protected by rubber gaitors. Built-in safety solenoid valves on every cylinder. Tank with air filter. Chrome-plated steel cylinder rods with high yield limit. Flow adjusters compensated on all downward movements. External control box. Illuminated control panel. Control with no electronic components. Cut off switch with key. Two-hand use for operator's safety. Motor with thermal safety device. Motor relay with 350 A silver pin (peak current) Bolted assembly plates. All steel parts of the hydraulic kit have been previously sandblasted, then treated with hexacrylic electrocataphoresis (except for cylinders, painted with bicomponent polyurethane enamel). Material conform to EC standards. Steel cataphoresis-treated pins. Anti-friction self-lubricating bushings. Delivered fully assembled and tested, it is to be mounted to the chassis by bolting, eliminating need to repaint. Special “Service-Free” Bushings At Major Wear Points No grease zerks to service. Low-Pour Hydraulic Fluid for better cold weather performance Toggle Switch Control, Stationary Mount Galvanized Steel Power Pack Enclosure Diamond Tread Platform Surface Circuit Protection - 200 Amp. 3/16” Thick Diamond Tread, 12” Deep Floor Extension Silicone Sealed Heat Shrink Electrical Connections Pressure Compensated Flow Control Valve Chrome Plated Piston Rod 12 Volt DC/Hydraulic Drive Meets TMC Recommended Practices Unequaled Shot Blast Liftgate components are prepped with a steel shot blast, cleaned and then coated for a finish that provides exceptional surface appearance, impact resistance, coating adhesion and wear resistance with twice the corrosion resistance of typical painted surfaces Master Power Disconnect (in cab) Yellow Di-Chromate Plated Pins at all pivot points.Pressure Compensated Flow Valve To provide constant and controlled lowering speed. Relief Valve prevents overloading during lifting cycle. Piston Cylinder Wear Rings To prevent scoring. 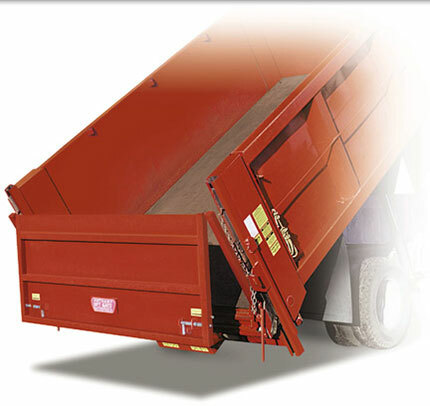 Platform Roller Wheel Opener Prevents metal-on-metal damage. EZ Mount Installation Completely Assembled Latch Pin Assembly To hold gate securely in closed position. 2 + 2 Warranty 2 years on mechanical components; 2 years on hydraulic system, parts, and labor. Low Operating Pressure Extends service life of power unit, hoses, cylinder seals, and battery. Dual Pump and Motors SLR - Maintenance-Free Self Lubricating Runners with LIFETIME warranty, no rollers or bearings. Rearward Folding Racks "Bar Grating" Style Platform Withstands concentrated, heavy loads; allows snow and ice to pass through. Built-In Lights Stop, Tail and Turn Galvanized Steel Power Unit Galvanized steel power unit enclosure with area for two batteries. Circuit Protection 200 Amp. in-line fuse protects against dead short in power cable. Large Bore Double-Weight Hydraulic Cylinder Allows system to operate at lower pressure. 2 + 2 Warranty 2 years on mechanical components; 2 years on the hydraulic system, parts, and labor. One "Up-Down" and "Open-Close" One "Up-Down" and "Open-Close" toggle switch control station mounted to the outside of curbside column. Hydraulically Controlled Platform For opening and closing. POWER Up, GRAVITY Down; and POWER Close, GRAVITY Open Cylinders Are Stored In Retracted Position To Extend Life Of Seals Low-Pour Hydraulic Fluid For better cold weather performance. Level Ride Platform Circuit Protection - 200 Amp. Heavy Gauge, #1 OT Power Cable (30ft. )Twin Lift Cylinders Directly Mounted To Runners No cables to maintain, fewer moving parts. Slim Profile Extends only 13" from rear of truck. Low Operating Pressure Approx. 2300 psi. For longer lasting hydraulic components. Power Pack Electrical Connections Enclosed in a separate weather-proof box. Gear Type Flow Divider Controls platform levelness, no adjusting required. Pressure Compensated Flow Control Valve EZ Mount Installation Completely assembled. Chrome Plated Piston Rods 12 Volt DC Drive Standard 5/16" Thick Runner Columns Designed to withstand dock contact, additional 1/2" thick plate guards overlaying runner columns in dock contact area. Swivel Ends On Lift Cylinders Make them "self-aligning" to prevent side loading damage and extend life. Master Power Disconnect Switch Mounted in power unit box. Heat-Shrink Wire Connections Meets TMC Electrical Recommended Practices. Power-Open, Power-Close Platform Effortless non-hydraulic opening and closing plus latches automatically engage as platform is raised. 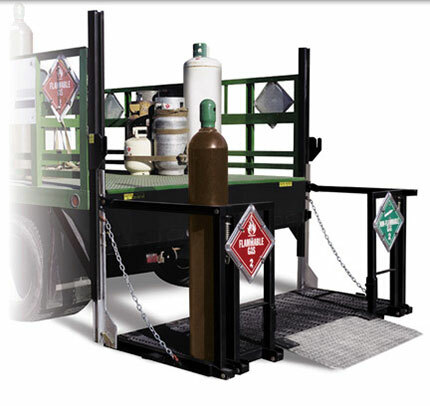 Level ride platform Maintains ride that is level with rear of truck. LIFETIME warranted slide runners Guarantees consistent, trouble-free service. Rearward folding racks "Bar grating" platform Withstands heavy, concentrated loads; allows snow and ice to pass through. Steel Pump & Cylinder Enclosure All hydraulic components are housed in one compartment and protected from impact, debris, weather, theft, and vandalism.Pressure compensated flow valve Provides constant and controlled lowering speed, loaded or unloaded. 2+2 Warranty 2 years on mechanical components, 2 years on hydraulic system, parts and labor. Marine duty sealed toggle switch Operates reliably under all types of weather conditions. Closed hydraulic system Protects against outside dirt, moisture, & other contaminants. Circuit protection 200 Amp in-line fuse protects truck wiring and power system in case of a dead short. Large bore double-weight hydraulic cylinder Allows system to operate at lower pressure. Chrome plated piston rod Keeps exposed surface free of rust and contamination to protect seals and extend service life. Low operating pressure Approx. 2300 psi. Increases life of components. EZ mount installation Shipped completely pre-assembled for fast, clean, easy installation. 12 volt DC drive Relief valve Prevents overloading during lifting cycle. Factory installed hydraulic fluid Prevents contamination during installation and insures proper fluid. Low profile platform 3" thick Heavy-duty roller chain drive Provides long operating life and greater reliability than cable drive. PRP Coating Platforms, components and weldments are protected with PRP Metal Polymerization anti- corrosive system for impact resistance, durability, and attractive appearance. Heat-shrink siliconed wire terminals and anti-rotation terminals Ensure positive electrical connections. Low pour (-70°) hydraulic fluid Excellent cold weather performance and long, trouble-free service. ZLC Zero leak concept Uses machined fittings, SAE "O" rings and JIC hydraulic connections. Replaceable bushings in sprockets Meets TMC electrical recommended practices.